Follow the money — in this case, into emerging markets. Since then, the shares are up another 12%, compared to breakeven results for the S&P 500 over the same period of time. What are investors in Brazilian stocks seeing that everyone else is not? For the second quarter in a row, Brazil posted better-than-expected positive economic growth of 0.2% “on the back of a rebound in consumer spending, reinforcing hopes for a recovery from the country’s deepest recession on record,” as The Wall Street Journal noted. In other words, there was already plenty of bad news (and equally poor expectations) about Brazil’s economy over the past few years. Funny how a well-deserved glimmer of hope makes stocks go up, isn’t it? So what about now, after the Dow Jones Industrial Average was walloped for a 234-point loss yesterday? Emerging markets are still the place to be. Brazil’s stock market is still cheaper (at a recent price-to-earnings ratio of 16.6) than the United States (at a similar metric of 22.3). From a dumpster-diving perspective, Russia (7.3), China (7.8), and even Sweden (13) are still some of the most undervalued stock markets out there. 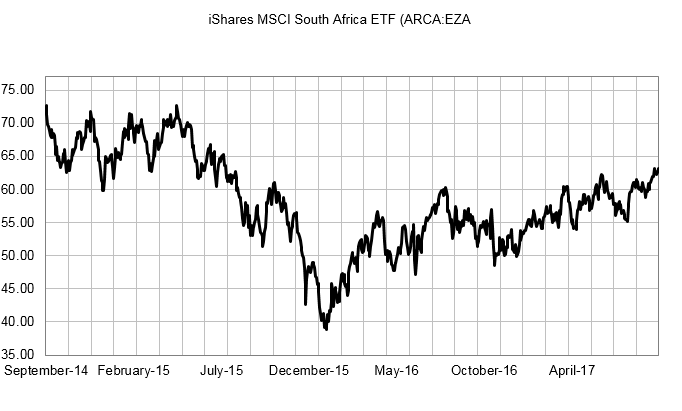 One of the better positions among the emerging markets might actually be South Africa (15.4), with the iShares MSCI South Africa ETF (NYSE: EZA). With gold prices on the rise, that ought to do wonders in helping firm up the value of the country’s rand currency. And like Brazil, South Africa’s economy is beginning to grow. Its economy expanded for the second consecutive period, growing 2.5% in the second quarter. Yes, the country still has its political and economic problems. Those are already well-reflected in the value investors assign to the market.